Stitch Story: Last Few Days To Vote for the 2010 Crochet Awards! Last Few Days To Vote for the 2010 Crochet Awards! Until March 30th you can vote for your favorites in the crochet industry. 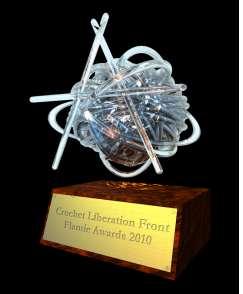 Each year this event, nicknamed "The Flamies", gets more attention and becomes more fabulous than the last, thanks to the "Fearless Leader" of The Crochet Liberation Front, Laurie Wheeler, who really puts her all into everything she does. Her passion for crochet really shines through in the way she promotes the craft! This year there will be a Live Red Carpet Party on April 18th, to announce the awards in Texas. How exciting is that! Even if you cannot attend the party, you can hear the results live or in the archives of Mary Beth Temple's Getting Loopy Podcast. Here is a reference guide to all the nominees to help you choose your favorites. You may discover some new designers, patterns, books, magazines, hooks, yarn, and videos! Please go vote now, and let the crochet industry know what you like. As an added bonus after you have completed the voting, you will be able to download as a gift, a lovely limited edition scarf pattern by designer Tracie Barrett! Can't believe the voting period is almost over! So excited to see the results. The Loken Cowl for Berroco!